Logic Masters India (LMI) announces Indian Sudoku Championship (ISC) 2017 (tentatively) in July-2017. Like the previous edition, the qualification for the ISC will begin early, specifically in January 2017. There will be a series of four online rounds (all part of Sudoku Mahabharat), which act as a qualifier for the offline national finals. The Top-60 players from the online rounds will qualify for the finals. There will also be a system to reward newcomers & inexperienced solvers to preserve the essence of Sudoku Mahabharat. This may include having separate criteria for the Mahabharat winner and the ISC winner. Location: South Korea What about Puzzle Ramayan - 2016-17? Location: India Converse and Irregular themes are missing. Is it that they are merged in some other themes? Moreover, the Standard and Neighbour themes are appearing again, probably the Round4 of SM. Converse and Irregular themes are missing. Is it that they are merged in some other themes? Moreover, the Standard and Neighbour themes are appearing again, probably the Round4 of SM. Good catch. Irregular & Converse are exactly the ones that Round 4 is supposed to be. I have fixed this now. Thank you. Location: India Prasanna, will the worst round be discarded? Prasanna, will the worst round be discarded? In each round, best Indian score among eligible players will be scaled to 100. Others' scores will be adjusted proportionately. For determining rankings for offline finals consideration, each player's best 3 scores out of 4 online rounds will be summed up to calculate the total score (so, the worst score is discarded). Location: India Can we have a frame with SM detail in the home page like we had in previous years. Location: india SM Round 2 IB is not yet available. As from 3rd Only it starts Please post the IB as soon as possible. when is the second round going to take place..? How to participate in it ? The second round is scheduled to take place from Feb 3 to Feb 6. There is no separate registration needed. You can participate with your LMI User ID. Please check the below link for how to participate. We have the criteria that participants are eligible for the finals only if they participate in 3 online rounds. We intended this to encourage regularity, but it discourages people who missed the first two rounds from participating. To address this we have made a slight amendment to the criteria, adding a case that solvers who reach the top 60 will be eligible automatically. This has been updated on the main SM page as well. Location: United Kingdom I'm not sure if this is the right place to post this, but I feel it pertinent to point out that normalising to the top scoring player (either indian or overall) is a very risky decision. As I have posted at length elsewhere, normalising is a very risky business - my recommendation is to get a consistent team of testers and not apply any post-normalisation. For example, it already looks like the scores are slightly lower for round 2 across the board. Running the dual rankings also leaves you open to the possibility that over 3 rounds player A could score higher than player B when normalised by top Indian, but lower than the same player B when normalised by top overall, which would (in my opinion) be highly unsatisfactory. Location: Switzerland I'll try to summarize the discussion and bring some weighted arguments to highlight the pros and cons of each system. Also, we can't speak about it without saying a word about the system of bonus points. Each round hasn't the same difficulty, hence the organizer has to find a good normalization scheme to ensure the fairness of global ranking. The solution of each axe is the starting issue of the other, which makes the discussion a bit hard. A normalization system will have problems if the players are not the same for each round. Ideally it requires the same population to fix a good reference point. For example, if Rohan doesn't play a round, the normalized scores of indian players could be very different. If several top players skip a round, then it will affect the normalized scores. A normalization system taking into account the performance of only one player (the best one) may be weak. Here we have 2 differents normalization references for the international ranking and the indian ranking, what can lead to weird effects on ranking, as described by Tom above. The pros of normalization system should try to improve it. In my opinion it's comparable to trying to have rounds of equal difficulty and having only one tester. It can't be ideal. If you make all efforts to have rounds of equal difficulty, and if somehow you failed, it'll be seen by everyone (for example if on a round all players make on average 10% more points than on other rounds, it would mean the difficulty isn't the same as other rounds). This is one of the real weaknesses of this choice to my eyes: as an organizer, you'll know if you succeed by seeing the results, too. You can't argue difficulty of rounds is the same if the ranking tells you the reverse. I'll separate my thoughts in several posts, to make them more digest for readers. At this point, I would like to say that if your thought is "the only thing that is interesting is to solve puzzles, this discussion is boring, uninteresting and completely unnecessary. ", please stop reading it and don't answer to it. Of course, if this is your position and you're a competition director, or a WPF responsible, or something like that, I'll be a bit disappointed if you're not interested to discuss about these topics, which could lead to some improvements. Location: Switzerland My second point is about making all rounds of equal difficulty. I'm not sure this is the wish of organizers of sudoku mahabharat, but I think it's good to include it into the discussion. I think nobody never really tried to achieve this at the higher level. In my opinion, the best that has been done so far was the sudoku GP 2016, but I still think it was far to be sufficient to ensure a fair ranking after the 8 tournaments. I strongly believe that round 2 was harder than any other rounds, for example. Having lot of testers will help to measure the difficulty with more precision. I'm not afraid to say that having a team of at least 20 testers would be needed. The accuracy of measurement would begin to be good enough. 1. Ask all authors to provide their puzzles before the beginning of the competition, test the whole bunch of 50-100 puzzles or more, and then spread the puzzles into rounds so that you can really control the difficulty of every round at the same time. This would require all authors cannot play a single round, because potentially there will be some of their puzzles in each round. 2.If you don't want to spread the work of authors into several rounds, then you'll have to ask more puzzles from authors, in order to chose them that will fit with the exact difficulty you want, let's say asking 2 times more puzzles that needed, and asking for a lot of minor changes in some puzzles (add/remove digits, etc...) which will denature the work of authors (I think good authors already try several configuration of each puzzles before chosing what he finds is the best one). To summarize, in my opinion, this require a lot of changes comparing to what we actually do: we would have to find lot of testers, and demanding much more to authors, what could potentially make loose some flavour to the competition (if the work of authors is denatured especially). Location: Serbia I see that I was misquoted here and think this is the opportunity to put the things on its right place. I hope this topic will not be deleted as the previous one on the other forum. In my last post I just wanted to reply to Prasanna who asked a question about the fairness, not to "answer to it", or provoke, or anything else. I'm sorry if I wasn't clear enough. I never said this discussion is completely unnecessary. I said the rules was too complicated completely unnecessary. Please, be precise when you quote me. Yes, I said it was boring and uninteresting before as a player, but didn't say it is boring and uninteresting now. You probably know my personal aspirations which are in contrast with many of current rules in GP. But this is not my private competition. I accept this role to serve the people and I am doing exactly the things which are in my job description. I can help with some ideas in a future discussion to find best system for GP, but I am there to set up the system which majority of players wants. Please, keep going with the discussion, I will carefully follow your views, as in the past few months. Location: Switzerland And finally I would like to speak about the bonus system. It is the tradition of online and on-site tournaments to reward players who are able to solve all puzzles before the time limit with some bonus points. I don't know another system that the one which consists of fixing nearly arbitrarily an amount of points for each minute saved. This idea seems easy and logic, but I don't think it's in all cases the best one. Historically, a few years ago, most tournaments were "harder", I mean by that, that very few players were able to solve all puzzle before the time limit. Now we see lot of tournaments which are built so that lot of players are able to finish them in time, with the solving time of the winner being sometimes less than half duration. And I think that in tose cases, the bonus system of pts/minute saved show its limits. As an organizer, how to choose this ratio of pts/minute? Of course, there are some parameters to think about, basically the total number of points of the tournament and the duration of the tournament, but also for the most evoluated version the target solving time of the winner. Despite these thinking elements, I fear the choice is still for a large part arbitrary. For players who aren't able to solve all puzzles, it's clear that the number of points they earn is the total of points of correctly solved puzzles. And it's not foolish to say that their score reflects their solving speed. If someone scored 80 points and another player score 40 points, we can say the first one was 2 time faster than the second one, or probably the second one would have needed twice as long to earn 80 points. Hence why not simply extend this property for players that solve correctly all puzzle before the time limit? If he needs half of the duration of the tournament, then his score will be the double of the total number of points of all puzzles. It can be applied in all cases, and doesn't have an arbitrary factor to be choosed by the organizer. It'll reflect correctly the solving speed of all players (players who solved everything on time and players who solved partial set). 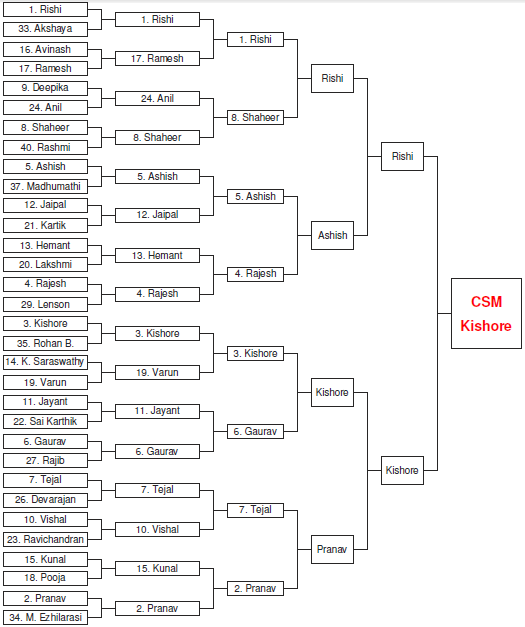 For tournaments where the winner use less than half time, typically here the sudoku mahabharat, or some of the rounds of puzzle GP (http://gp.worldpuzzle.org/content/unofficial-results-wpf-gp-puzzle-2b), using bonus system of pts/minute will produce lower differences between scores (provided that the factor of pts/minute is somehow low, of course). Then the effect is the illusion that easier rounds produce less difference between players. But it's only an illusion, because if you're 3 times slower than the winner, you probably don't deserve to have more than half of his score. I'll not provide more examples, everyone can think about it and see the implications on ranking of tournaments. I'll just add that, because we are speaking about sudoku mahabharat here, that I think the actual system tends to squeeze the rankings on the top. For example solving all puzzles (100 points) in half time will bring you only 145 points, it doesn't reflect the level of top players comparing to others. I see that I was misquoted here and think this is the opportunity to put the things on its right place. I hope this topic will not be deleted as the previous one on the other forum. I didn't want to quote your post in the GP forum in particular. I only have the feeling that this is a posture of some people in the community to answer "The only thing you should care about is solving puzzles", when I point out some issues, or try to have some clever discussion on various subjects. I'm glad to hear that you're open to the discussions and will follow them. I'm sure you'll make your best to try to improve the GP for the majority of players in the future. And no I didn't know that your personal aspirations are in contrast with many current rules of GP, as you didn't speak about that publicly (or I missed the discussion). Location: India As one of the core organizers of the first edition of Sudoku Mahabharat a.k.a. SM (2014-15), I'd like to share a few thoughts (mainly focussing on SM). * SM's main goal is to select the Indian team via Indian Sudoku Championship, and to give an exposure to the 'newer' upcoming players via offline finals and SM playoffs. Which have been successful for 2yrs IMO. * SM is primarily for Indians. International results and scores should be independent of this. The home page text says 'This is a national contest aimed at encouraging the best sudoku solvers of India to participate and experience the excitement, thrill and puzzling atmosphere on the lines of various national championships and the World Championships.' So, using international scores in any form is unnecessary. But having the scores on the score page gives an indication of 'where you stand' among the best players in the world. - It is more difficult and time-consuming to ensure consistent difficulty across rounds. And even more difficult when each round has a type-based theme. - A simple normalization is better than nothing at all. And doesn't take any time. * As a participant / solver in SM last year, and as per the discussions with my fellow Indian solvers, everyone I spoke to (which includes the top-20/25 solvers in India today) is happy with the current scoring system. So, I don't see any reason for things to change in SM. * For international scores in SM, the only thing that gets impacted are LMI Ratings. Well, that is open to discussion as long as the Indian system remains the same. To sum it up, I think SM is great the way it is. We all have our personal opinions and preferences, and its perfectly ok to agree with some and disagree with others. I, too, personally didn't like the GP scoring system last year due to which I'm not participating this year. Its my personal decision and choice. Location: United Kingdom You make some good points Rohan, and I suppose this discussion is largely academic. In terms of ISC qualification, the ambiguities are likely to be so far down the list that it would be a real surprise if they then came good and hit the top 4 at the ISC - so it probably won't make a difference to A team selection. Still, academic discussions are interesting, and having done the analysis prior to the "around the world" round at the 2013 WPC it's fair to say that the limitations of a simple normalisation scheme can be minimised so long as the relative point of normalisation isn't volatile between rounds. But, I also found that in order to give any more than a vague indication of "where you stand", then you also need to take into account the full distribution of solvers. From the data I looked at, the top score didn't do a good job of summarising the different distributions, even when the top score was sort of stable. Normalising by top score on this data resulted in some quirky results between the top 10% and top 50% of ranks. I said before the scheme was risky. As with any risk, it is not guaranteed to materialise, but that shouldn't absolve the responsible organiser from taking that risk into account. With themed rounds, I think you have an increased risk of volatility in the top score; and if Rohan didn't participate in one of the rounds then the volatility is practically guaranteed. Location: India Is the date/venue decided for SM finals? Location: INDIA can some one tell me when will the registrations for ISC will start? Location: India Any updates on the finals - is the date yet to be decided? Everyone in the Top 60 is directly in right?